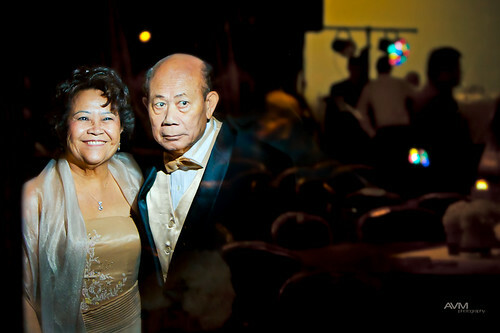 The Rondaels… Maximo and Didi… 50 years of marriage… their Golden Anniversary… so hard to imagine. It’s such an incredible milestone! Even after all those years, you can still see that spark in their eyes when they are together. So beautiful! Even more incredible is the indelible impression these two leave with everyone that they meet. So many people came up to them to congratulate them and also to get a picture with them, almost as if they were rock stars! They hardly had a chance to have their dinner! But were they bothered by any of this? Not one bit! They were as kind and inviting as ever. I photographed this reflection of the two of them on a window pane outside of the reception hall when the party was winding down. While it may seem like a ghostly image of them, to me it’s more than that. To me it’s an image that transcends their mortality into immortality. After all, I believe the true measure of a person’s success isn’t by how much material wealth they accumulate, but by how many hearts and souls they have touched along the way. And for so many years they have and continue to touch so many hearts and souls... together.